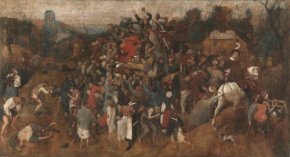 15/12/11 - Acquisition - Madrid, Museo del Prado - The painting by Pieter Brueghel, the Elder, Saint Martin’s Wine, recently rediscovered by the Prado (see news item in french of 24/9/10) and which the museum was finally able to acquire, is now hanging in the galleries, having joined the other works by the artist already there, including the famous Triumph of Death. The canvas underwent a restoration which turned out to be particularly long and complicated given its problematic conservation earlier. The museum is offering a special, three month, presentation, room D, explaining the work involved in the restoration.